Today seems like any other day. Yes pain is there, yes people around me seem to be living such easy lives, yes I have my ups and downs emotionally, but today is quite different as well. I have been reading The Holiness of God by RC Sproul for awhile now and I have been learning so much about who God is. It hit me today that in Genesis 2:17 God says to Adam and Eve that they will surely die if they eat of the forbidden fruit. They did, but they did not immediately die. Do you ever wonder why? The Bible says God is slow to anger, abounding in love and faithfulness. It doesn't seem fair that we are in pain daily, but compared to the fact that if God gave us complete justice for our sins we would die immediately when we sin, we have been given mercy. Yes, God showed mercy on us by letting us live another day even in our pain. It has been granted for us to suffer. Suffering can come in many forms. Physical suffering is just one way that God bestows mercy on us. 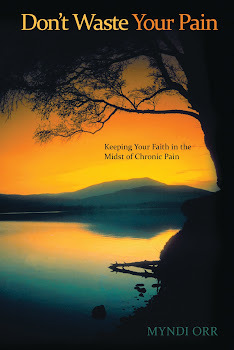 This is something people who don't suffer with chronic pain will probably never understand, but in our pain we draw closer to the creator of the universe. God is so holy we can't be in his presence, yet He chose to draw us to Himself through the blood of Jesus-How amazing! In our pain we struggle each day to find meaning and purpose and in those times we can draw close to God, allowing Him to minister to our hearts. Let Him today...He is so good.